The Plushbed attempts to do something that many people find impossible: produce a 100% latex mattress that provides a great night’s sleep without feeling like you’re laying on top of a rubber band. You might be surprised, check out our review of the Plushbed Botanical Bliss now, and find out if you can get a high end latex mattress that provides a great combination of bounce and comfort, with excellent support and cooling. Should I Buy the Plushbeds Mattress? The Plushbeds mattress attempts to set itself from other latex mattresses by using a completely latex construction. Additionally, the Plushbed has 3 latex layers, outnumbering the two that are most commonly found with latex beds. The bed is also offered in different thicknesses, from 9” to 13”. This review covers the 10”, which is a standard height for other latex mattresses. Top — the top layer of the Plushbeds mattress is designed for temperature regulate. It is 1” thick and is part of their organic cotton and Joma wool cover. The thick cover provides relief from pressure points, and the Joma wool helps to keep the bed cool and acts as a fire barrier. Middle – The middle layer is also designed for cooling, but also focuses on comfort. 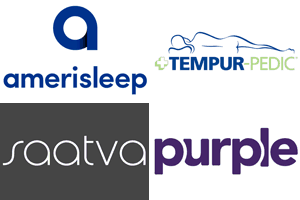 It has several properties that relieve pressure points and offer the support most sleepers are looking for. The latex used also offers great bounce, while providing a good amount of comfort and cooling. Combined with the comfort and support offered by the top layer, these two layers provide a great combination of support and comfort. 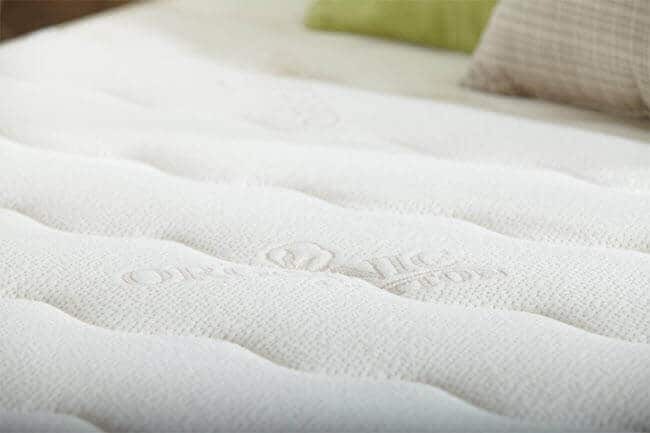 Bottom – The bottom layer of the mattress is made from 6” of ARPICO organic latex and works to provide support while acting as the foundation of the mattress. ARPICO is a 100% natural product that is manufactured from the sap of rubber trees. It offers extra deep compression support for the Talalay latex in the middle layer, and makes the mattress comfortable for heavier sleepers. As you can see, the Plushbeds mattress utilizes a thinner top layer attached to the cover along with an underlying top layer that work to combine different qualities to get great comfort and great cooling, a difficult feat to achieve in an all latex mattress. 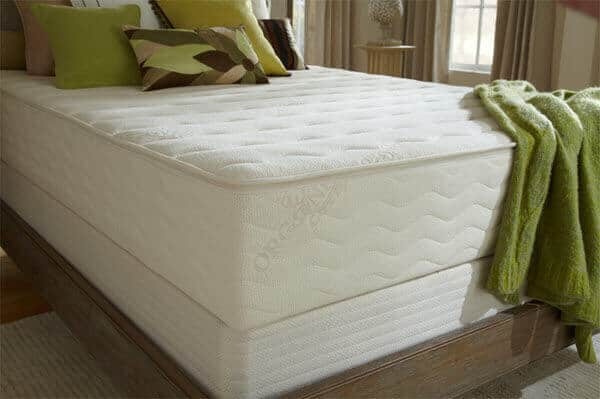 The cover used by the Plushbeds Botanical Bliss mattress is very unique, and plays a large role in why the mattress feels as good as it does. It is made from 100% organic cotton with a layer of Joma Wool beneath. This makes it very soft and plush, while still allowing ample airflow to create a breathable latex mattress. The wool in the mattress is 100% Joma wool. It has the capacity to absorb 30% of its weight in water and not feel wet. This allows it to store the moisture from humidity and sweat that can cause mattresses to feel stuffy and helps to keep your skin cool and dry. The wool is hypoallergenic, anti-microbial, and is resistant to pests like dust mites and hazards like fire. All of the noteworthy things about the cover are in the materials used. It has a very standard look to it. The top is off white and It has a wave-stitch pattern on the side that make it stand out a bit from other modern mattresses, but that isn’t anything to write home about. The Plushbed Botanical Bliss comes in 4 different levels of firmness. On a scale from 1-10, with 1 being the least firm and 10 being the most firm, the softest option rates at a 3.5, the medium is a 5, the medium firm is a 6.5, and the firm is an 8.5. This variety in different firmness levels means that it’s likely that you can find a Plushbed that fits your preferences. All in all, this mattress has a very pleasant feel to it. It can easily compete with many of the hybrid latex mattresses that use some latex, but also incorporate other foams and materials in their construction. 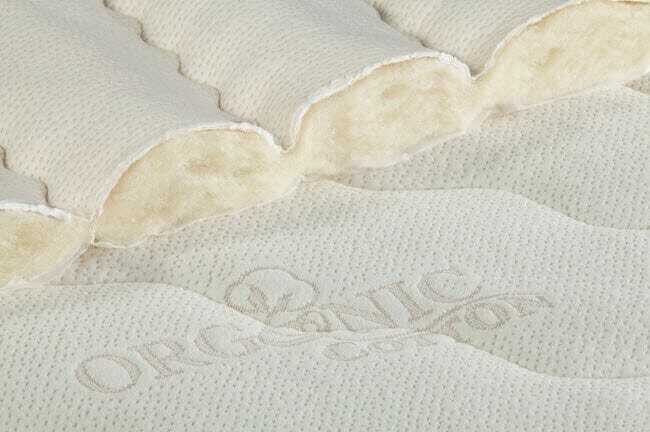 The Plushbed Botanical Bliss has a nice sense of bounce, and provides good comfort and pressure relief. The mattress does produce a good amount of hug and contour, but it is different than the hug and contour you get with a memory foam mattress. The latex has a more rounded feel so the sensation is more of the mattress molding around your body rather than sinking into it. Another benefit of the latex is that it provides excellent support for pressure points. This means the mattress is good for people who sleep on their sides, stomach, or back. The mattress pushes gently against your body to keep you in position, but doesn’t act so springy that you feel like you’re about to be thrown from the bed. This is a fine line to walk, as it is easy to create a mattress that is far too bounce which results in motion transfer issues and the feeling that the bed is pushing you away. It’s also easy to create a foam mattress with no bounce that keeps motion contained so well that it makes adult activities take a bit more work than they otherwise might. The Plushbeds mattress also takes full advantage of latex’s natural cooling abilities. The mattress remains cool and pulls heat away from the body. The wool layer under the cover do a great job of helping with that, as it removes moisture from your skin which helps to cool it off. It also keeps the temperature of the sleeping surface stable. Finally, the Plushbeds Botanical Bliss mattress also takes full advantage of the bounce you get in a latex mattress. This helps to keep things interesting for grown up playtime in the bedroom. The bounce you get is as near as it gets to a traditional spring mattress without using springs or coils. That’s a hard feat to pull off with a foam mattress, and speaks well for the Plushbed’s construction. We do sinkage tests on all the mattresses we look at so that we can give you an accurate idea of what it will be like to use the mattress day-to-day. The tests are done by an individual who weighs ~140lbs, so your results might be a bit different than the numbers we get. Laying on Back – laying on the back in a normal sleeping position with weight evenly distributed produced 1.5” of sinkage. Laying on Side – laying on the side with weight evenly distributed in a normal sleeping position created 2” of sinkage. Full Edge Sit – Sitting on the edge with all of the body’s weight resting on the bed caused 3.5” of sinkage. Standing in Middle – standing in the middle of the mattress with both feet planted resulted in 5” of sinkage. Shipping – Shipping is free. The mattress will show up at your house in 7-14 days compressed in a box. Warranty – One of the better in the industry. 25 years. 10 years for full replacement and 15 years prorated. Covers indentations of 1.5” or more. Trial – Plushbeds gives you 100 nights to decide if this is the mattress for you. It should be noted that the Plushbeds Botanical Bliss mattress can be rather difficult to move. The drawback to the latex construction is that when it isn’t lying down it can be floppy and hard to align and hold steady. There are many people who will enjoy the Plushbeds mattress. Sleepers that want more bounce than you can get with memory foam will be among the first to get in line, as the all latex construction provides the best bounce that you can get outside of an innerspring mattress. People looking for a truly medium firmness will also love this mattress. Plushbeds has done a great job hitting the medium firmness feel while preserving bounce and doing it all in an all latex mattress. Moreover, the mattress comes in four different levels of firmness, so most people will be able to find an option that meets their needs and preferences. Hot sleepers will also enjoy the Plushbeds Biotanical Bliss mattress. The Joma wool does a great job of helping the natural cooling properties you get from latex construction when it comes to keeping the mattress and the sleeping surface cool. The coolness is also consistent and the properties of the wool help to regulate the temperature to maintain a stable sleep experience. People who want more body support also do well when it comes to ordering this mattress. The latex used does a good job of molding to the body. The contours and hugs that result from it are much more rounded than you get from a traditional memory foam mattress, which helps to prevent the sinking feeling people sometimes get. This helps to relieve pressure points that can be created by different sleeping positions, especially side sleepers. On the whole the Plushbeds Botanical Bliss mattress will be an excellent choice for most sleepers. Heavier sleepers may be especially interested in the potential to get a mattress with good deep compression support that still provides the hug and contour that have made foam mattresses so popular lately. The price is a bit on the higher end, but it isn’t much above what you would expect to pay for a latex mattress, and it delivers on its promises to be a latex mattress that has great cooling and great comfort.